China officially enforced its punitive tariff on American wines on Monday, adding another 15% on top of the existing 14% import tariff, casting uncertainty on the prospects of American wine in mainland China. According to a statement posted on the Ministry of Finance, the new tax regime is effective from 2 April and with no specified end date. This means that American wines coming to China after this date are subject to a 29% import tariff, bringing the total amount of taxes levied on American wines up from 48.2% to 67.7%* including VAT, excise tax and import tariff. It’s most certain that the new policy is going to adversely affect American producers who already count mainland China as its key export market. However it’s too early to gauge the full effect it will have on American wine exports in general as the majority of American wines are consumed domestically. China only ranks as the fifth biggest export market for the US after the EU, Canada, Hong Kong and Japan. The Wine Institute of California warned early on that the new policy is going to mean “lost market shares for years to come” at a time when its main competitors such as Australia and Chile are steaming ahead with free trade agreements and tariff reductions. At the moment, American wine exports to China only account for 3% of China’s entire bottled wine market. China imported 9.633 million litres of American wine in 2017 worth about US$75.6 million, according to figures released by China Association of Imports and Export of Wine Spirits. It’s worth noting that the import volume dipped roughly 1%, but its value increased by more than 44% last year, suggesting a trend of premiumisation of American wines shipped to the mainland. Its average per litre price stood at US$7.85, only after that of New Zealand and Canada. Wang Xuwei, head of the China Association of Imports and Export of Wine Spirits, estimated the short term effects of the increase will be limited, given that American wine’s market share in China is small and the majority of its wines are consumed domestically. But for American wineries or Chinese wine importers that have betted heavily on American wine’s growth in China in recent years, the ramifications of the retaliatory tax are going to be vast, he added. “In a few years time, China is set to become the world’s second biggest wine market,” he said. “During that period, China’s wine imports are going to grow at warp speed. In a time like this, it means basically that the US has lost its chance. From this point of view, it has a very significant impact on the American wine industry, especially for its long-term strategic development,” Xuwei explains. 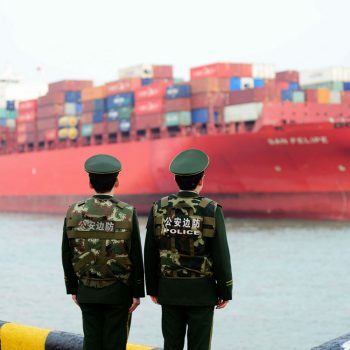 More worrisome, is that Chinese consumers’ may shun American products in general as a nationalist response to the two countries’ growing frictions over issues ranging from human rights to trade spats, as seen before when relations with Japan and South Korea became strained. South Korea, for instance, lost 7.5 trillion won (US$6.8 billion) because of China’s decision to boycott South Korea’s tourism industry over the Korean government’s decision to install a US anti-missile system last year, according to the country’s National Assembly Budget Office. Caught in the trade spat are importers and wineries who were racing to ship their wines to the mainland when the proposal was announced on 23 March, uncertain of its implementation date at the time. Now, containers of wine coming to Chinese ports have to face the hiked tariff.